I've started English Paper Piecing again and need some magnification to see to piece without eyestrain. I've been using my husband's magnifying light, but it's a desk light and I have to hunch over it, which tires me quickly. I'm looking for a good magnifying floor lamp. I saw the Ott Lite version, but the reviews say that the rigid part of it is too high, so the bendable part doesn't reach down far enough when sitting in a recliner like I wanted to do. I saw that the rigid part of it is about 3 feet high, which I'm pretty sure would be too high. I've looked online and found several lights with mixed recommendations. I'd like to hear specifically from quilters here if they've found anything that works well. 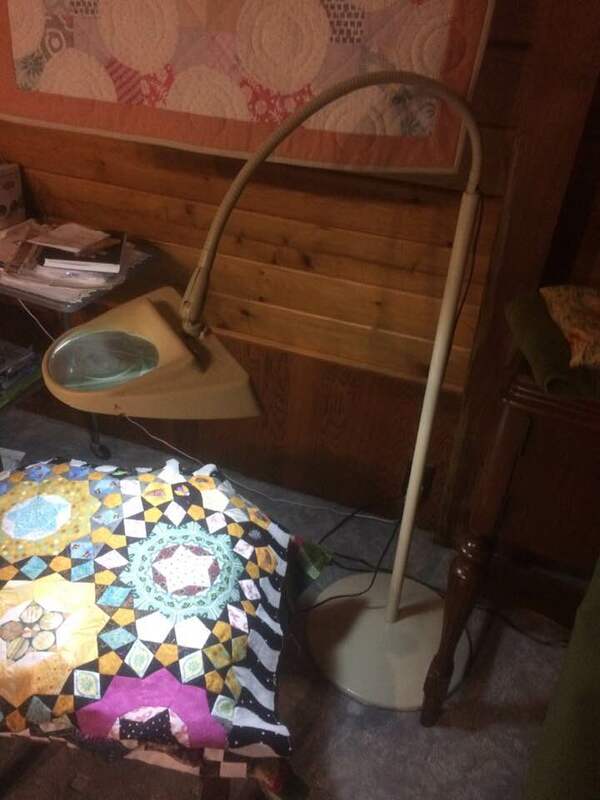 Does anyone have a recommendation for a magnifying floor lamp that they've had good luck with, one where the bendable part reaches down far enough to be functional when sitting in a recliner? Nobody ever went wrong with kindness. Can you use a higher strength 'cheater' eyeglasses to get the magnification you need? That's what was recommended to me - years ago, now - by my eye doctor. Otherwise, try checking architectural-type magnifying lights. That is what I had purchased for my grandmother ages ago for her to be able to continue needlework while lying in bed. Worked a charm for her. I have used the magnifying light you wear around your neck. It worked great. It's big but not heavy. Buy the best one, they aren't expensive. I've used one of those and the magnifiers that go over your glasses. Both work well. Those are good ideas. Thank you. The magnified eyeglasses which goes over your own glasses is from Harbor Freight and works very well. I used them to do my EPP of 3/4" hexagons and the small 24" quilt was very nice. I keep them in an eyeglass case. They are much better then the magnifiers that you put around your neck. Hope you find something your like. I have an Ott floor lamp that is bendable and works great. I've had it a long time though. Not sure what they make now. Edit- sorry, mine isn't magnified. where are you located in Washington? I have a wonderful floor stand magnifier light, I'd be glad to swap it for fabric, we could meet up somewhere. Super heavy and stable. I assume you're in Kalama? I am clear up in the Redmond, WA area, and not much time to travel. I do appreciate your offer, though! Thank you! I may try something like that. The problem with anything over my eyeglasses is I have base up/down prismatic correction, meaning that my eyes have to be balanced in the up-down correction. My many permutations of glasses never quite do that right, so my pinpoint vision (for sewing) is off. I've given up on getting good correction for intricate work from glasses because I can't stand wearing my glasses while paper piecing. I still have decent close up vision otherwise, so I've found my own eyes with magnification work best. The magnifying desk lamp worked really well for seeing, but since it doesn't work so well with my tired and slightly injured shoulders, I figured a floor lamp that I could adjust would work better, so I could lean back. I have to be particular about how I sit for long periods of time. If only I could only find a magnifying floor lamp to settle on. I may just have to go through many permutations before finding the right one. I have an Ott Floor lamp with a magnifier that is on it's own bendy thing. The model I have is no longer available but this is the closest model they have now. I love it and I often sit in my recliner fully reclined and have the bendy magnifier close to me while the lamp illuminates above me. It works great for me. Edited to add I also wear glasses. Oh, and I don't use the clip thing ever. I use mine for all hand work, applique, EPP, embroidery, hand quilting, sashiko, etc. Last edited by feline fanatic; 12-02-2018 at 01:57 PM. UPDATE from me, the OP. Today I picked up a nice clamping magnifying desk lamp at everyone's favorite craft shop -- Harbor Freight. It's not a floor-stander, but it has a much longer arm than the little desk lamp I already have. It has fluorescent, rather than LED lighting, which is a bit of a shame. The light is daylight quality, though, and the color rendition is awesome. The bright side of the fluorescent light is that it's replaceable, which is seldom true with the LED magnifying lamps I've seen. It also has a cover, so I don't have to worry about sunbeams coming through the window then shining through the lamp and creating a fire. Yes that's a problem people have talked about and shown pictures in reviews. Oh the fond memories of starting little fires with tiny magnifying glasses as a child, ha-ha. Anyway, thanks everyone for the ideas. They were all very helpful. Sharyn, can I take you up on that offer? I'm in Vancouver and work in Woodland, would be willing to meet you where ever. I have plenty of fabric I'd be happy to give you! You may want to send her a private message. Hope your SW Washington trade works out.